November visits upon New York dank, leaden chill and multitudes of ducks. I vastly prefer the latter, particularly those species that don’t frequent this area during the warmer months. 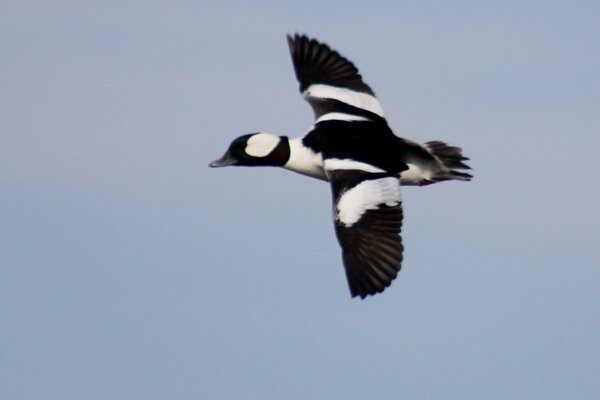 One beloved bird to keep an eye out for is the Bufflehead, a beauty in black and white. Bufflehead are fascinating little creatures. 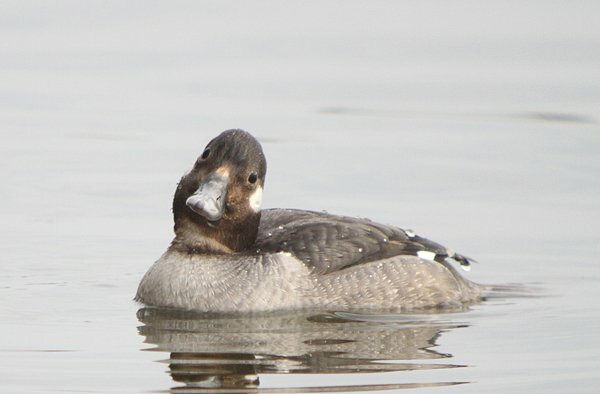 They are exceptional divers and, unlike other diving ducks, can take off from the water without running along the surface. There are all kinds of interesting facts about this species, and yet, a mere listing of its many estimable traits will naturally fail to address the question which is doubtless on everybody’s lips: What’s with that name? The tale of Bucephala albeola is a long one indeed, with as many twists and turns as the Pacific Coast Highway. 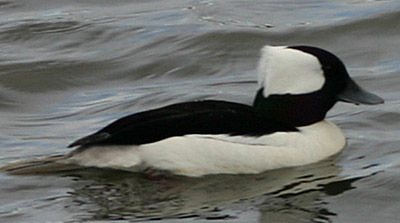 Called petit garrot in French and hime-ha-jiro ‘princess white-wing’ by the Japanese, the bufflehead has seen a number of name changes here in the U. S. of A. Even its Latin name is not its first; for some reason, it was formerly named Choritonetta albeola. Bufflehead comes from the now archaic word buffle, meaning ‘buffalo.’ Bufflehead is the condensed version of ‘Buffalo Head’, the name these ducks were originally given. I suppose the densely feathered, black and white head of the drake does slightly resemble a buffalo’s head. These birds have also been called buffel duck, spirit duck, and butterball. That’s a long list for a little bird. A bufflehead may be cute on waterfowl, but it garners much less respect on Homo sapiens. Predictably, the term can be used to describe someone who has a large head or, alternately, a heavy, stupid fellow. The title of this post is a line attributed to Plautus, a renowned playwright of ancient Rome, one I suspect that wasn’t directed towards a duck. Thanks for the very interesting info and the nice pic. I’m very fond of these birds too. We live on a small lake in southern Michigan (Jackson). We get a large gathering every spring estimated around seventy. Not only do they arrrive at about the same date, but in the exact same location on the lake. They are here for aproximately one week. Very active! It’s a Sunday morning, and I am watching a single male on our pond outside of Kalamazoo, MI. I’ve never seen a bufflehead before; I hope he’ll stick around for a while, because he is a beauty and really fun to watch! Cool, Mike. I don’t know Plautus as well as I should–do you recall offhand what word he used that Ehcard then rendered “bufflehead”? I think we should rename it “Princess White Wing”. What a poetic and appropriate name! I’m with you there, Pat. Does anybody out there know other Japanese bird names? I bet there are others just as evocative. @Rick, good question about Plautus’s original epithet. I don’t know it. @Patrick, “Princess White Wing” is certainly more lyrical than buffalo head. Does sound like an anime character though! Lol. I like what you unearthed, Rick. I find it interesting that ‘stolide’ translates as ‘stupid’ or more colorfully ‘bufflehead’ when the English derivation ‘stolid’ now just means unemotional or apathetic. Fascinating. First time seen on our pond. March 31.